When a collector couple approached the artist Bonny at a Texas art festival and asked her if she would consider painting a life-size Pony, it was a smart choice. 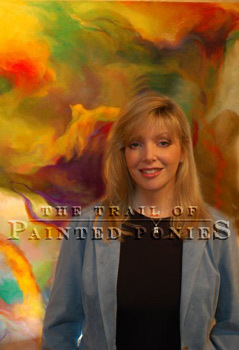 Bonny was a nationally known figure whose work hangs in corporate collections. She has been the subject of numerous articles in magazines. 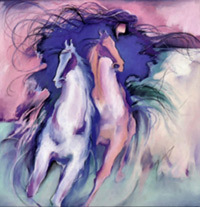 She was also an artist with a national reputation for her stylized depictions of elongated horses with long flowing manes and tails, stampeding across enormous canvases. Even though Bonny is not a rider herself, her extensive research into the equine world, together with her gift for uniquely combining color, line and form in equine imagery, resonates deeply with people who have a passion for ponies. IGAO, International Guardian Angels Outreach, is the organization that sponsored Bonny’s life-size Painted Pony. It is a Dallas, Texas-based organization dedicated to bringing orphaned Russian children to the “land of promise”. While the organization expressed the desire for the design on the Pony to reflect their humanitarian mission, they left the details up to her. And they could not be more pleased with the results. “I wanted to integrate the warm red and deep gold colors associated with traditional Russian matruska dolls,” Bonny explains. “At the same time I wanted to include children’s faces peering out with hopeful expressions, surrounded by flowers and birds. In the original life-size Pony, a child, cast in fiberglass, sits at the Pony’s feet, waiting to be transported to America. Painting a Pony was a new artistic challenge for Bonny, but it wasn’t disruptive because the opportunity came at a time when her own work was going through a transition. 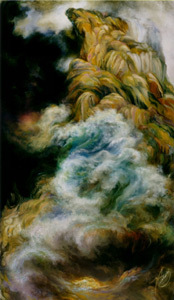 As commercially successful as her horse paintings have been, she found the work becoming predictable and formulaic. “There was a time when, if I was going to do a gallery show, I would know if I did five pieces 20”x 20” in these colors, and two larger canvases in another color scheme, it was a guaranteed sell-out. Now, I’m listening to another voice that is telling me to go in a new direction. To paint more abstractly. To go with my feelings. Now, I’m more comfortable taking risks rather than going for the sale. With “American Dream Horse,” Bonny has created a work of art that lives up to its name in multiple ways. American Dream Horse , a collectible figurine inspired by Bonny's original "American Dream Horse ". To view the life-size Painted Pony created by Bonny, and learn more about IGAO, visit: www.igao.org. Residence: I have visited a lot of naturally beautiful places in Hawaii, Florida, California, but I wouldn’t want to live anywhere other than where I do, in Dallas, Texas. Biggest Artistic Influence: It’s changed over the years. In college I loved the “great artists”. Then I was drawn to commercial artists. For a while I found myself influenced by traditional artists such as Frederic Remington. Now I find myself drawn to contemporary artists like DeKooning, as well as realists like Rubens. Favorite Song: "Bridge Over Troubled Waters." I recall that song when things look dark. Favorite Color: Even though I don’t use it a lot – I tend to go with gold, orange, yellow and greens – red is a big impact color for me. Favorite Words of Advice: Let go of expectations and be where you are. Personal Hero: My mom. She always gave me excellent advice when I needed it, and she exemplified it in her own life.